Material goods and components drive our world in so many ways. Pull the manufacturing curtain to one side, and you’ll find Belt Conveyors are frequently at the heart of getting those items to their final form, ready for the mass market. Asmech Systems are proud to be able to offer a wide variety of belt conveyor systems for many different applications and to suit your operational workforce. Just advise us of your requirements tell us what you need, and we’ll guide you to a suitable solution, ensuring that your requirements are met and even exceeded. What can Belt Conveyors be used for? It’s a pertinent question – one that’ll very likely crop up during your research. Asmech Systems has more than 20 years’ experience in the conveyor and materials handling industry deciphering when, where and how to utilise belt conveyors. To ensure you have the correct system for your application. As a rule, Belt Conveyors are extremely versatile, and are used globally for large and small-scale product and material transfer. Applications can range from sending raw plants or grains towards a treatment centre, moving computer hardware through a warehouse, or guiding hundreds of retail items to a packing team. More visible, commercial uses of Belt Conveyor systems include supermarket tills and luggage handling at airports. So, whether you’re a manufacturing giant or a customer-facing business, there may be a use for Belt Conveyor in your operations. Belt Conveyors are incredibly diverse, with so many prospective applications to consider. 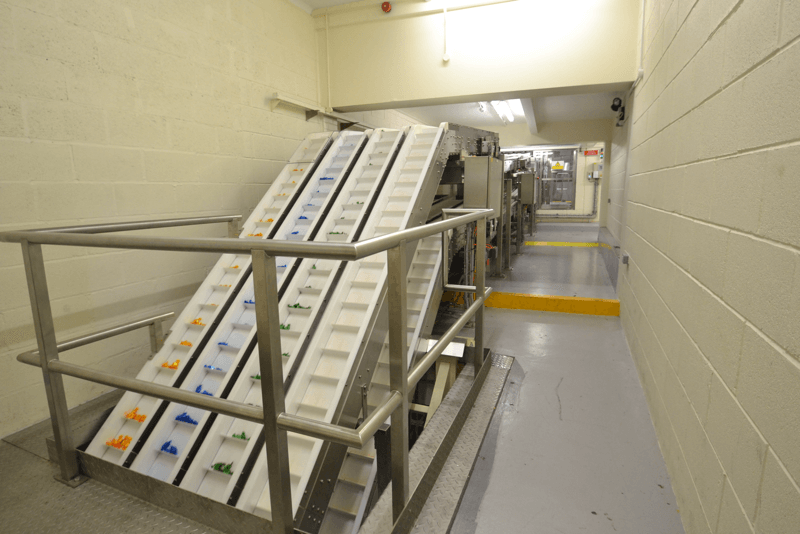 Over the years, Asmech Systems have gained wide and varied experience in the design, manufacture and long-term quality of conveyors. It will be an investment you can rely on. At Asmech Systems we manufacture our Belt Conveyors from Stainless Steel Grade 304, or Mild Steel. Then Powder Coated for greater aesthetic protection. The conveyor belt itself can be for a bespoke surface, to suit your product requirements. All requirements are perfectly feasible. If you are unsure of exactly what you are looking for our sales engineers will be happy to offer advice. Including everything from how extensive the belt conveyor systems needs to be, through to a quick and painless installation. For additional or special applications, Asmech Systems can design your Belt Conveyor with product specific extra’s if needed. Auto tracking that realigns belts moving off-centre. For more information on our Belt Conveyors or any other conveyor or automation enquiries please call us on 01623 424 442 for a no-obligation chat, or message sales@asmechsystems.co.uk with your thoughts or enquiries!